We were contacted a few weeks ago by a company named Jukz Shoes, and they asked us to try out their slides and flip flops. At first I thought to myself, “Flip flops? What can be so different about these flip flops?”. Then I went to the company website, and I was very intrigued. The package I received from the good people at Jukz contained a pair of basketball slides, Texas Tech football flip flops, and a baseball hat. I personally have worn the basketball slides for about 10 days. 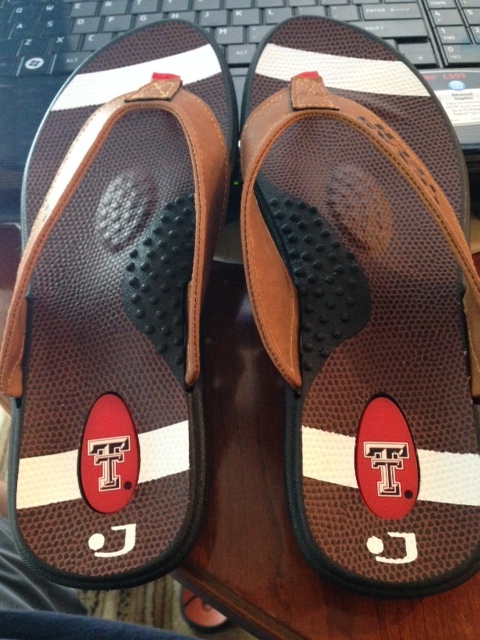 The football flip flips didn’t fit me, so my wife has been wearing them. She loves hers and thinks they are incredibly comfortable, but this is my review, so I’ll concentrate on the basketball slides. I was initially skeptical of how it would feel to have a basketball on the bottom of my foot. While a basketball cover is soft, I was afraid that I would get blisters. Well, 10 days later I can say that these are the most comfortable slides I have ever worn. For the past 10 years I have worn the same Adidas slides that everyone else has. They were comfortable, but to be honest, it was time for a new pair. The opportunity to try out the Jukz ones could hot have come at a better time. If there was one complaint I have about the slides, it would have to be that they are a bit heavy. But I am OK with it. 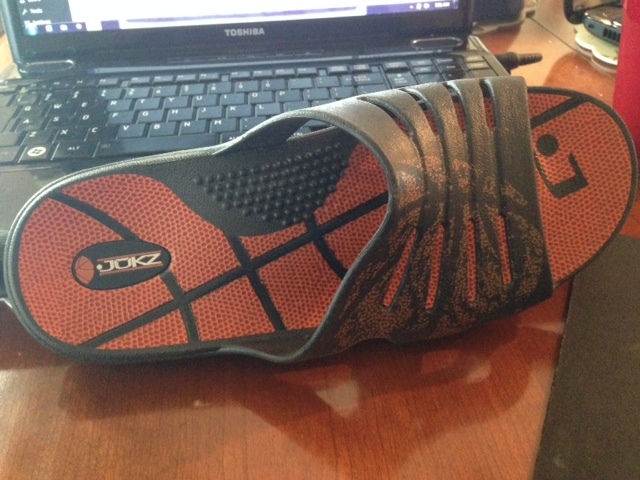 The bottoms are very sturdy, and have a good amount of grip. You won’t feel like you will be sliding all over the place in these. I have literally worn these everywhere I have gone in the past 10 days and my knees/feet/hips don’t bother me at all. When wearing my old ones, after a while those joints would start to get a little sore. At the front of the slide, there is a toe lift for added comfort. It’s actually really comfortable. I never thought about wanting something like that, but it really does make a difference. At $34.99, Jukz shoes are right in line with the competition. To purchase Jukz products, click here. 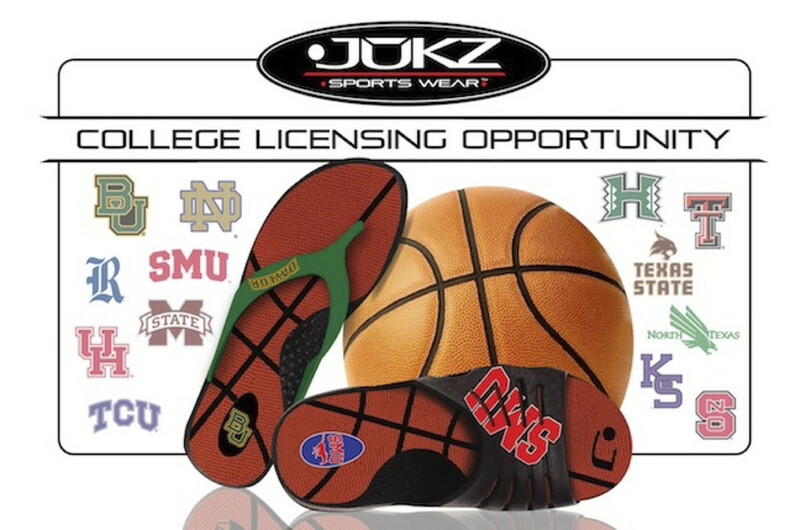 Jukz also has licences with many top NCAA schools. If you are a Notre Dame football fan, or a North Carolina State soccer fan, check out Jukz wide line of collegiate gear. They have added some new schools, so please have a look. 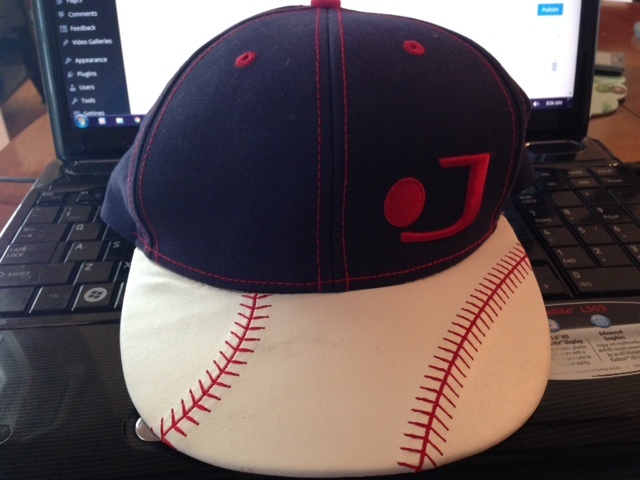 Lastly, Jukz sent me a Jukz Baseball hat. This is really cool. The brim of the hat has actual baseball stitching, and the brim feels just like the surface of a baseball. I need to break the brim in a little more since I’m not into wearing flat bills. I don’t have nearly enough street cred as some of my colleagues to pull that look off. I want to personally thank the good people at Jukz Shoes for sending me these products. They really have something cool going on here and wish them the best of luck in growing their brand.